Finahub Official Blog: How India Governments Direct Cash Benefit Transfer works? How India Governments Direct Cash Benefit Transfer works? What is India Governments Direct Cash Benefit Transfer? How it is better for India if it gives cash transfer instead of food/fertilizer subsidies. Assume One kg of rice is approx Rs.25 in the market. Let's say the farmer sells it to the Retailer at Rs.10 approximately. But, government's Food Corporation of India (FCI) procures it for its PDS (Public Distribution System) at MSP (Minimum Support Price) of Rs.15 approximately. And then, sells the same rice at its ration shops for Rs. 15 approximately. Now, the govt has given a subsidy of Rs.15. This is 2.25 lakh crore subsidy per year approximately for the entire nation. But, the complications start when intermediaries divert the rice from PDS to open market. (Note the Rs.10 profit they can make). Adding to that the inefficiency costs of govt - salaries to PDS employees, bureaucratic complications, go-downs wastage, trucks, transport, etc. On top of this, corruption at ration shops, ghost cards, invisible beneficiaries etc. It is seen that more than 40% of these grains do not reach the final beneficiary. So, the govt is paying a whopping 2.25 lakh crore and it is inefficient. On top of it, it benefits the corrupt people, and moreover, it does not benefit the ones in need. If the beneficiary, had a bank account, with one click, the govt could have transferred the subsidy of Rs.15 that it anyway gives, and the poor person could have directly bought from the market. 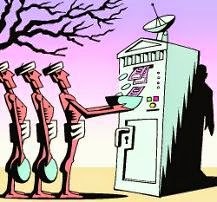 This would ensure that the govt would not involve in the PDS, MSP system, no go-downs, no transport, no ration shops setting, no bureaucrats needed, no corruption, no ghost ID cards, nothing. Moreover, since all the food grains are available in the market (and not procured by the govt.) the price would drop drastically. So, the beneficiary gets all his money electronically, lesser price in the market, more options to buy from without any govt inefficiency or corruption at all. This should be the ideal system, where subsidies are given without any human interference at all. This is why all people need a bank account. So the program Pradhan Mantri Jan Dhan Yojana aims to get bank accounts to every citizen in India. For faster enrollments of bank accounts, banks / other financial institutions use Aadhaar based E-KYC solution. Do you think this new system is good for us? Share us your thoughts.